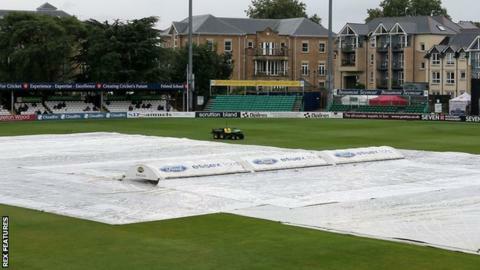 Bad weather restricted Essex and Somerset to only 55 minutes of play on day three of their Championship match at Chelmsford. Division One leaders Essex could add only 41 runs to their overnight score and ended the day on 158-4, 153 ahead. Nick Browne was bowled by Tim Groenewald for 83 but Adam Wheater remained unbeaten on 58. Rain forced the players off at 12:10 BST and they did not return, with play eventually abandoned at 16:00. After being out for single-figure scores in six of his previous eight innings, Wheater is within seven runs of overtaking his highest score in the Championship this season. Essex began this match 41 points clear of second-placed Lancashire, who are in a strong position in their match against Warwickshire at Old Trafford. Somerset also need points as they fight to move out of the bottom two, although losing almost a full day to rain means this low-scoring contest may now end as a draw. "It's probably beneficial that there were so many wickets on that first day and second morning because it meant the game went forward quickly. "It's pretty evenly balanced at the moment. I don't know what the morning's going to bring. "But I'm sure we're going to bat for a little while and see where we go from there." "If you look at how the game has gone, wickets have fallen in clusters, and when you establish a partnership things can seem to mellow out a bit. "Mohammad Amir showed on Wednesday with his quick wickets just how quickly things can change. "With the skill he has, he can turn the game on its head like that. So we'll be looking for quick wickets in the morning, for sure."